If you’ve ever been sagely advised that the thing you’ve put your whole heart and soul into, sorry, just doesn’t cut it, then you’ll know how I felt when a veteran published author told me precisely that about my book, Goodbye Crackernight. And he was right. It was, in fact, a nearly useless morass of good ideas out of which a Book would have to be excavated. And the veteran author didn’t even think that. Luckily for me, by that time I had assimilated the Three Golden Rules of Publishing. Which I then applied to the task of turning a promising mess into a good book. And in due course, by the time my neighbours had become fully resigned to the sound of a grown man biting off wallpaper between rabid bouts of typing, swearing, light-bulbs going off, pennies dropping, sobbing, straining, advanced labour contractions and more typing, it seemed I’d… maybe… well, fixed it. 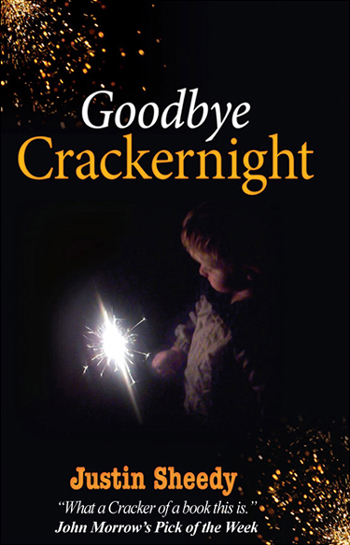 Goodbye Crackernight was published at the end of 2009. 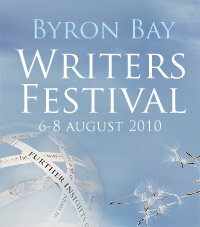 At the beginning of 2010, I was invited to the Bryon Bay Writers’ Festival. I then received a phone call. It was a woman, her name was Julie, a journalist for the Byron Shire Echo. You can always tell when someone is smiling down a phone line, can’t you. Though I’d never spoken to her before, there was this tone in her voice as if we’d spoken many times already. She said she’d read the book, she was still laughing, also crying, and thanked me for writing it. After I’d regained consciousness, she said she’d be in touch. 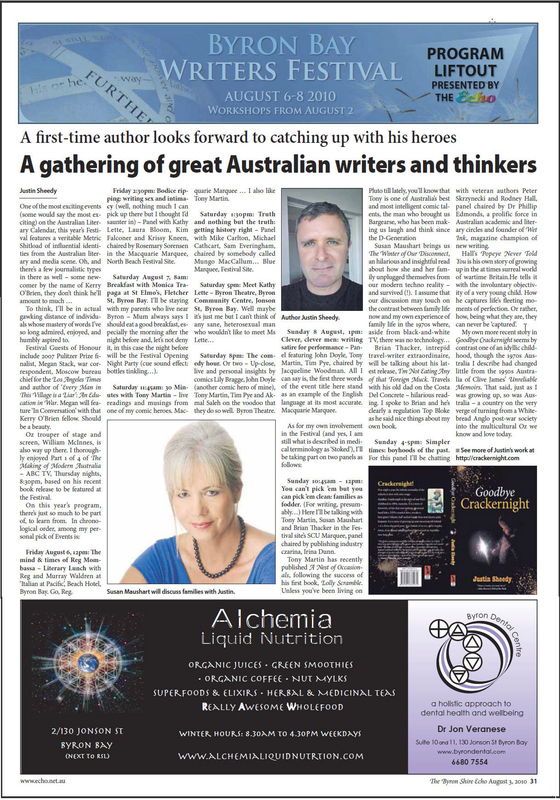 And that she fully intended to give my book key coverage in the special Festival Week Edition of the Byron Shire Echo. To this day I don’t know whether Julie of the Echo phoned Jeni of the Festival or indeed whether Arthur phoned Martha or visa versa, who knows, but re the Byron Bay Writers’ Festival 2010, yours truly was On the Program. Now the festival program hadn’t been finalised as yet but, while I waited for my official ‘Acceptance of Invitation to the Festival’ paperwork to arrive in the post, Jeni Caffin cleared me to go nuts on Facebook, which I did, and people started to read my book, one reader describing my writing style as one of ‘detailed brevity’ – as description I’ll long cherish. A lovely lady by the name of Sandy Neilen wrote the following mini review of Goodbye Crackernight. 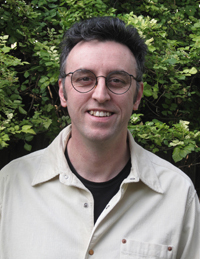 Sunday 8 August 10:45am-12, “You Can’t Pick ‘Em But You Can Pick ‘Em Clean: Families as Fodder For Writing”. Here I’d be on a ‘panel’ with authors Susan Maushart, Brian Thacker, and one of my comic heroes, Tony Martin, chaired by Australian publishing czarina, Irina Dunn. Plus another panel from 4-5pm, “Simpler Times: Boyhoods of the Past” with veteran authors, Peter Skrzynecki and Rodney Hall. I raced out and read all their books to be featured at the Festival, my favourites being Tony Martin’s Lolly Scramble and Peter Skrzynecki’s Boys of Summer, a hauntingly beautiful/tragic portrait of his childhood in 1950s suburban Australia. But August finally arrived and, on the eve of the Festival, I received a phone call from author Peter Skrzynecki, who said he was looking forward to meeting me at the Festival and our panel together though, in his experience of such festivals, they were often characterised by a feeling of anti-climax. “But at least it will have happened,” he said. On Tuesday morning, August 3rd, release date for the Festival Week Edition of the Byron Shire Echo, I rabidly checked online. I’d been sweating on Julie’s promised ‘key coverage’ of my book for months and this was the week, this was the day, this was the hour. And what do I find?! Julie of the Bryon Shire Echo had come through. The Echo’s Festival Supplement opened with my own recent online article on the Festival, almost in its entirety. There was my ugly mug. There was the cover of Goodbye Crackernight. And from there the day went from excellent to excellenter as Radio ABC North Coast phoned, asking me if I’d care to do a live phone interview the next morning on my book and the Festival. For me, bliss: At the appointed hour golden morning light beams in through the kitchen window, the smell of freshly-brewed coffee wafting as the phone rings. It’s Justine of ABC North Coast Radio. A perfect moment in one’s life. Yes, having for months believed that Festival Opening Night was on Friday August 6th 2010, having been told by a string of successful authors, “Yep, see you there, Justin”, having written an extended online article about how much I was looking forward to Opening Night on Friday August 6th then having had that article printed as the lead story on the Festival in a commercial newspaper and finally having checked that I was indeed on the Opening Night guest-list on Friday night it was on Thursday night. It always has been. Every year. The sight of a grown man weeping is never an easy one for onlookers to bear, let alone for the parents of that grown man, but, on the bright side, at least now my poor father would not have to bear the sight of me pouring myself into his car at the end of Opening Night reeking of martinis and cigarettes and wearing Kathy Lette’s feather boa. With my panel appearances on Sunday, Saturday was for taking in the vibe, and what a vibe it was: Wall-to-wall book-lovers strolling between and packing out three huge marquees and three minor, something excellent underway in each at all times. My first impression of the Festival was that the crowd was overridingly female: Think Left-leaning cashmere shawls, expensive sunglasses, funky jewellery, a dramatically coloured hairdo here and there, the occasional poncho and male. For this is the demographic that buys, reads, and (not surprisingly) publishes books in this country. On the morrow, I resolved, I would try to connect with them. Tony went on, was introduced, and began to read. What then transpired was 30 solid minutes of mass hilarity. What had seemed very, very funny to me as printed words on a page was transformed, by Tony’s vocal performance of it, into something quite transcendentally comic: As if the passage hadn’t been written to be read but to be performed, the few hundred in the audience simply lifted from one level of delight to the next from start to finish. And, hell, I was on-stage with this guy tomorrow? Next Up: “In Conversation – Living it Large: Two Wildly Worldly Women” where, to another capacity crowd, Kathy Lette and Gretel Pinniger would share something of their remarkable lives. Kathy Lette, who needs no introduction, was at the height of her sassy, wicked-quipping form. 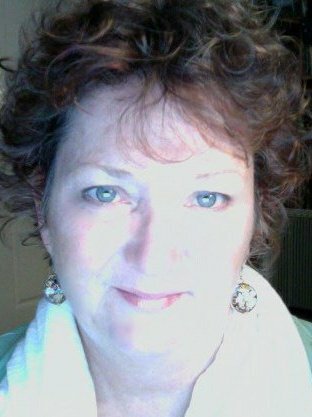 For some readers though, Ms Pinniger may need some introduction: Gretel Pinniger, a.k.a. ‘Madame Lash’, was an iconic figure of the 1970s/80s Australian avant-garde, a stripper, artist and performer extraordinaire, a breaker of boundaries. Up on this stage, however, she did not seem happy, mentioning that she felt her recently published biography had portrayed her performance persona, but had missed the true essence of ‘her’. I don’t assume she intended to, but she projected a sense that her ‘wild life’ had taken its toll on her, and her gravity, her sadness, flowed through the crowd. Though Lette was supportive, as was the crowd, it seemed for one dreadful moment, that Gretel could not go on and that ‘the plug’ might have to be pulled on the event. Just as it seemed so, Gretel began an extended poem on her life and experiences, something that could not be called a ‘performance’, as in moment it was real. It was Truth. It was Dignity. At the end of it, many in the audience were crying. Yet if there is any living testament to the words, ‘The show must go on’, it was that woman… And go on it did. Next: “Truth and Nothing But the Truth: Getting History Right”, where Mike Carlton discussed his latest release, Cruiser, the true story of the life and death of warship HMAS Perth torpedoed in World War Two. Here Carlton referred to the young adults of that generation as ‘the finest generation Australia has ever produced’: In Carlton’s opinion, they lived through the Great Depression and hardly ever grumbled, then not only went to war just as selflessly, but triumphed. Countering this, chair Mungo MacCallum offered a story told to him by his friend, iconic Australian author, George Johnston: It was a true story of the young Australian soldiers of the 8th Division en route to the Middle East in transport ships at the outset of World War Two. On board with them were a number of young (and very new) Australian Army officers who were ‘unpopular’ due to their perceived incompetence to lead other young men into battle. Each night as these unfortunates passed the ordinary soldiers’ hold in the ship, they would be taunted with a low and menacing chant of, “Sharrrk meat… Sharrrk meat…” In conclusion, it is a matter of historical fact that a number of these new officers did NOT disembark from the ship when it berthed in the Middle East. (!) In response to this, Carlton emphasised that he did not intend to gloss over such truths or unduly idealise the generation he referred to, rather, to pay homage to the ‘overriding decency’ of the generation as a whole. With the light turning golden, shadows lengthening, it was time for me to catch my ride back home to Alstonville – my father waiting for me in the car just outside the festival gates. As I ambled down that dusty road, tired but happy, I found myself approaching two smiling faces. And, yes, they were smiling at me. Could it be? Was it…? Yes, it was. Jody Luanne Cavanagh and Lynda Taylor from Facebook. What a lovely way for me to end my first day at the Festival, walking, laughing and talking as we did like old friends down that road. (And Jody had just won the Festival’s live-performance Hemmingway-style short story competition this very day!) Our respective lifts just up ahead, they would see me tomorrow, they promised. When I would be ON.